The announcement made by President Vladimir Putin on Monday’s congress of the dominant United Russia party created quite a sensation. 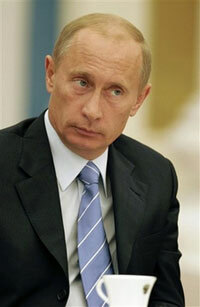 Putin said he would head United Russia’s candidate list in the December elections to the State Duma. United Russia could not even dream of getting such a “star” candidate. With Putin atop its list, United Russia looks poised to easily winning a two-thirds majority during the upcoming parliamentary elections. The Russian president’s another statement was close to a sensation too. Putin said he would be ready to become prime minister, provided a “decent, capable and modern person with whom I can work” was elected president next March. Now that Putin has made his statements, the key intrigue relating to Russia’s next presidential elections is probably no more. The latest developments indicate that the Russian political system may go through significant changes after the presidential elections. What are the implications of Putin’s decision to head United Russia’s candidate list? First off, United Russia will retain and solidify its position as a dominant party. The move is a great disadvantage to United Russia’s main rivals, both ideological (the Communist Party of the Russian Federation) and pro-Putin ones (Just Russia). The former and the latter are unlikely have any leverage with lawmakers in the next Duma. Things could have run a different course a while ago. The emergence of Just Russia made much fuss in the Russian media and political world. Just Russia might have become a second dominant party, the one which could curtail United Russia’s monopoly. It is obvious now that a two-player plan has been deleted for good. Vladislav Surkov, the Kremlin’s chief ideologist, seems to have got the upper hand. He always proposed that United Russia be turned into a force capable of dominating Russian politics, a party whose majority holds sway over the Duma. In view of the above, there are two jobs waiting in the wings for Just Russia. In the short run, it will be used for hamstringing the Communists and booking politicians deemed acceptable for the powers that be. It may as well be used for restraining United Power for tactical purposes. United Russia’s long-term mission is historic in nature. The party will be used for gradually squeezing the Communists out of the political spectrum in order to create a two-party system featuring controlled and loyal political forces (with a number of marginalized players still on board). Second, Putin’s leadership of the list has greatly increased the possibility of his heading the government after the presidential elections. Putin made clear that the option was in the bounds of possibility. And he also mentioned two conditions that had to be met for him to become premier. “To head the government is an entirely realistic proposal but it’s too early to think about this,” Putin said. First and foremost, United Russia should win a majority in the December elections. And a “decent, capable and modern person with whom I can work” should be elected president next March, Putin added. By all appearances, it is most likely that a technical figure, a bureaucrat will be elected president and Putin will become prime minister. Third, two scenarios can be drawn up using the above assertions. The first scenario provides for constitutional changes, which would weaken the powers of the presidency while strengthening the role of the government. The real powers of a Russian prime minister who is widely seen as a presidential figure in terms of institution must be on a par with a real political weight of Vladimir Putin. The second scenario involves a rather limited amount of time during which Putin will serve as a prime minister. Putin’s successor could tender his resignation in some six months, allowing Putin to be elected to the presidency again. It is hard to tell which of the two scenarios will eventually become a reality. Both of them imply a number of political risks. A stronger prime minister would inevitably grow more dependent on a parliamentary majority. Today’s parliamentary majority is, without doubt, fully controlled by the Kremlin. But the situation is going to change, and a new form of interdependence will emerge once a constitutional reform is in place. Consequently, Putin will not be able to exercise full and absolute power – he will have to take into account the presence of an elected president and elected parliamentary majority. The scenario involving early retirement of his successor appears to be more beneficial for Putin. The scenario would bring things back to the status quo. The question is: How would the West react to the move? Could it be interpreted as yet another step toward autocracy? Putin is undoubtedly aware of these factors because he wants to be seen as a civilized leader, the one whose country makes part of the G8 group. In any case, his decision to head United Party’s candidate list means a lot for Russia and its future. It would be safe to say that Putin will hold sway over the Russian politics in the future. He looks set to be at the helm under any scenario.